So, remember the other day I made kitcheree? 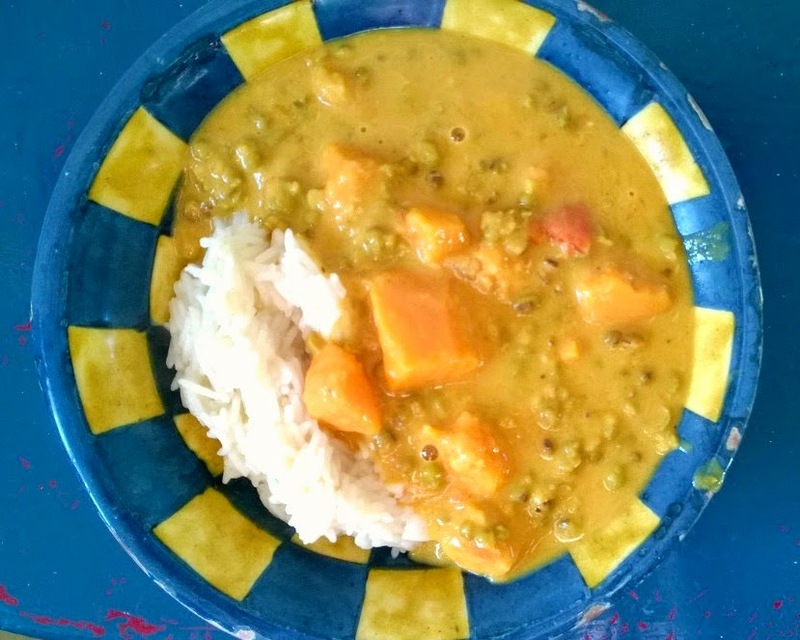 well this is kind of following on from that - it pretty much has the same ingredients and the same ayuervedic principles.Like the kitcheree this is made up of mung beans, rice, and sweet potato. Here's how I made it. method - fry the chopped onion in a little vegan butter and olive oil (coconut oil would have been better but I didn't have any), then add chopped garlic and grated ginger. Cook down for a little while and then add the spices, cubed sweet potato and 3 tomatoes (peeled and chopped). Add the mung beans (which have been soaking overnight) and tomato paste (a good squirt), cover with water and the lid and cook for about an hour or until the sweet potato and mung beans are cooked. Take off the heat and stir in a can of coconut milk. Serve with basmati rice. hello! here are some photos from my life recently! my new jumper! my face! treats from the vegan kind , inspiration for a magazine we are putting together in work, a face scrub from my ayurveda course and some food! scrambled tofu on toast and soup! life is good, no? or kitchari - depends how you wanna spell it. it's hard to take a photo that doesn't look gross. I learnt about it on my ayurveda course. quick ayurveda info - there are three doshas (sort of like a body type) - Pitta, Kapha and Vatta (you can find out which one you are here). each dosha responds differently to different foods, so there are some foods that some people should avoid because they have difficulty digesting them. but kitcheree is something that everyone can eat. all the doshas are welcome to a kitcheree party! there are lots of recipes out there so have a little hunt around... but heres how I made mine. next mix in some spices - turmeric and cumin, or anything else like that. then pour in a cup of mung beans (I soaked them over night) and a cup of rice. add water to cover and then cook until its all soft. it's up to you how wet or dry you make it. you can make it quite a dry rice or a more soupy dish if you'd rather. oo forgot that I also added a little coconut milk at the end. its really good - like a soft risotto. it's quite plain but makes you feel good. what do you add to it?